This weekend I am doing my first proper cookery demo at The Greener Living Show in the New Forest. To make things as easy as possible I am keeping it simple and seasonal. 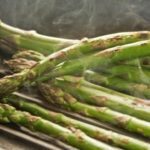 I will be cooking asparagus three different ways to show how one vegetable, if prepared differently, can taste completely different. First and foremost; boiled asparagus. A great way of cooking asparagus but it’s hampered with the lingering fear of over cooking it and ending up with a soggy, limp green stalk. I don’t bother putting only the stems in the water so the heads can steam gently, I just throw it all in and it works every time. I like this way of cooking asparagus because it has a silky, soft texture when done. How long you leave the asparagus boiling for depends on your texture preferences and the size of the asparagus. I normally cook it for 2-3 minutes and then check it unless it is very thin. Remove the bottom inch to inch ½ of the asparagus before boiling as the ends can be woody. Asparagus is always wonderful when smothered in butter. It’s even better when there’s some acidity to cut through the richness. While the asparagus boils make the flavoured butter to go with it. Beat the butter until softened and creamy and then grate in the zest of the lemon and orange and a good grinding of black pepper before mixing together. When the asparagus is done, remove it from the water but don’t completely drain it. The water clinging on to the asparagus will thin out the butter a little. Put knobs of butter on to the asparagus and then squeeze the orange juice over the top. If you can’t be bothered with a hollandaise I reckon this is the next best thing. Sweet, juicy asparagus spears covered in salty, fragrant, citrus butter and the recognisable flavour of pepper. The butter is slightly thinned by the water and orange juice meaning there is ample sauce to mop up with crusty bread. This is great! I am looking forward for the English asparagus to come into season to try this! No too long to wait now! How awesome! I wish I was there to see you! I love all these ways…. I like Alida can’t wait for asparagus to come into season. Good luck and hope you have fun doing the demo. This sounds great! 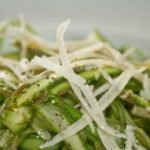 I eat my weight in asparagus when it’s in season so I love new recipes for it! I love this idea, although I don’t cook asparagus at all, we eat it mostly fresh or grilled. But the orange juice over the asparagus sounds very tasty. I shell try it next asparagus time! Thanks! Its simple and such a fabulous idea. I’m going to give this a try soon. The citrus butter sounds lovely! Sorry that Bangkok is so far away and I can’t come and watch the demo in person. Hope it goes well! Good luck with the demo! Do you live near the New Forest then? I’m in Hampshire (Fleet. My Mum was from the Romsey area. I’ll probably be trying your citrus butter idea very soon, because my Asparagus is just beginning to produce. If you have difficulty getting the texture right, try steaming rather than boiling – that way you can poke it more conveniently to see if it’s cooked yet! Love this simple and healthy recipe with asparagus. 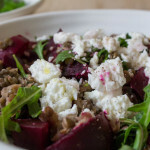 I wish I saw this recipe earlier for I could I have made it for this weekend. This is a great blog! Thanks for posting! Anyway, thought you might enjoy them. I love asparagus and I usually just bake them in the oven with some butter or olive oil. But I love the three different ways you did them! Glad I stopped by! I was just talking to my parents last night about how much I love asparagus. This ia great, simple way to do it–and good luck with your demo! Delicious combination of flavours, love the citrus butter sauce, especially since I’m not keen on hollandaise. Good luck with the demo! Thanks for linking this in. Have a great week.